Awesome Games Done Quick raises money for Cancer research. We found this infographic on Engadget. Video games are just as much fun to watch someone play as they are to play, just look at the success of Twitch. One of the things we love to watch is Awesome Games Done Quick. This features speed runners who are so good at a certain game that they can get from beginning to end is a very short amount of time. 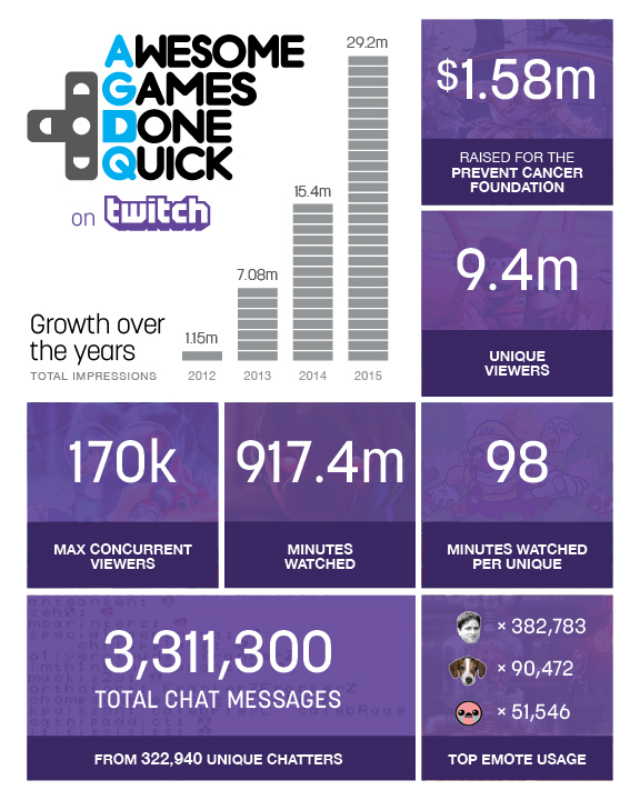 In January of 2015 after 160 hours of live streaming on Twitch, 9.4 million unique viewers and one marriage proposal, Awesome Games Done Quick raised almost $1.6 million dollars to help fight cancer from gamers donating.